And in this journey, our conviction in this model of education has been recurrently reinstated by prolific illustrations wherein our students have imbibed the hands-on knowledge and have applied the same to produce quality results. Restraining education within the limits of theory is detrimental, especially in the modern production driven industry. As designers, one not only needs to know how to produce a successful design, but the applied knowledge of how to shape that design into a product ready to be vended is equally important. Practical understanding also reinforces the academic base and gives the candidate the required self-reliance to explore new options and experiment with designs and resources. It is with this motive to impart self-confidence that Swati Surampalli from team INKUISITIVE set out with forty-three students from Maratha Vidya Prasarak Samaj’s College of Architecture & Centre for Design, Nashik towards Kolhapur to experience the art of making Kolhapuri Chappals and Hupari Silverwares. The batch was a mix of students from interior design, set design and product design, and the itinerary was fixed in order to accommodate specific studies and learning experiences for each batch. The program was designed to give maximum acquaintance to the students on the aboriginal crafts of Kolhapur. 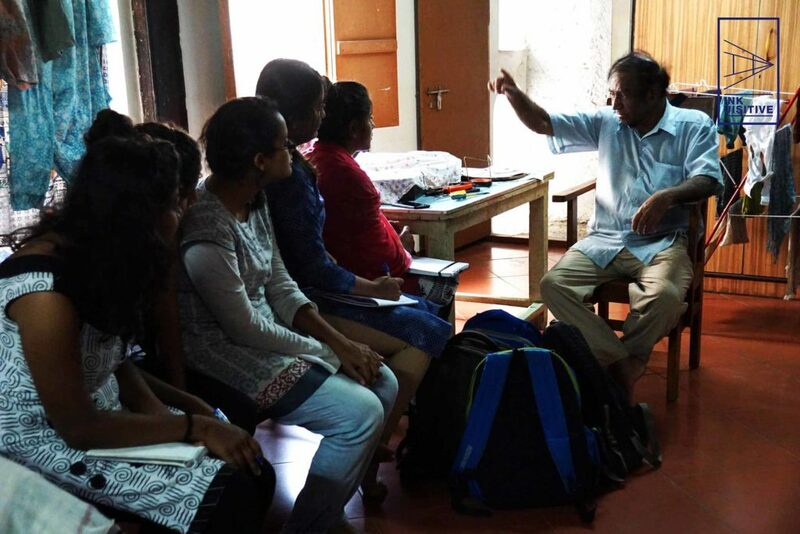 Having arrived at Kolhapur, the students were given an orientation about the entire program before setting off for the real deal. 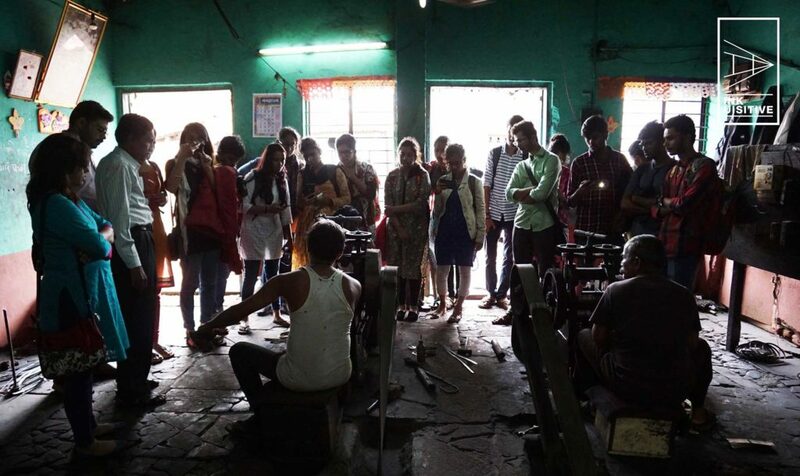 The day started off with the students proceeding to the workshop of Mr. Arun Satpute, a celebrated craftsperson from Kolhapur where his team makes Kolhapuri Chappals. He has been in this trade since the last few decades and is one of the stalwarts in this field actively working to keep this dying art form alive. 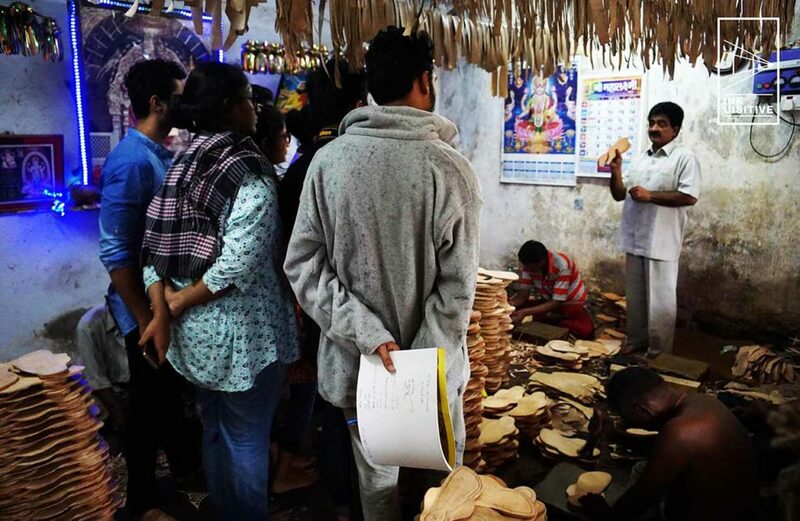 The students were briefed about the entire procedure of the make- starting from processing the raw leather to packing the finished chappals and shipping them to retailers. 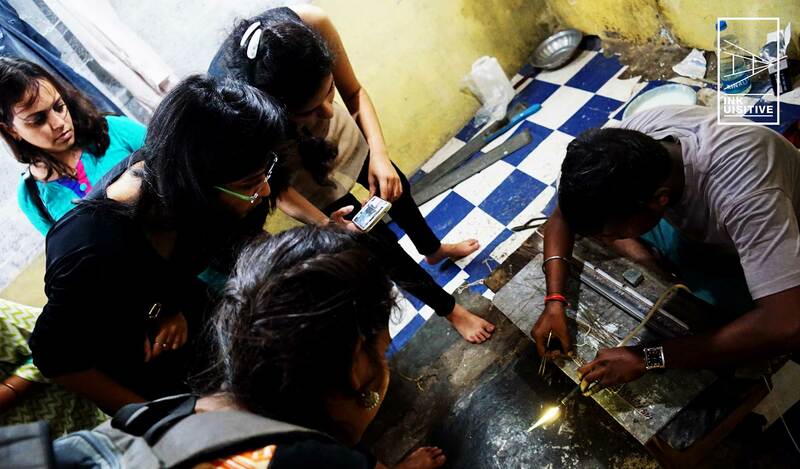 Mr. Satpute guided the students inside his workshop showing samples of work at each stage and demonstrating in minutiae while workers worked by the side. Post orientation, students of product design stayed back for further elaboration on the same, and those from Interior Design and Set Design proceeded to a nearby Wada for a live study and detailed documentation. 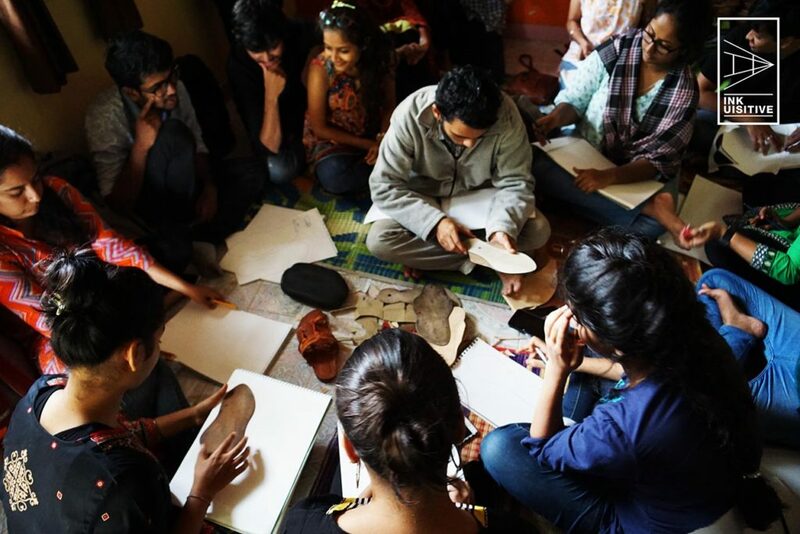 Students in the chappal workshop immersed deep into the technique and continued to complete their assignments. 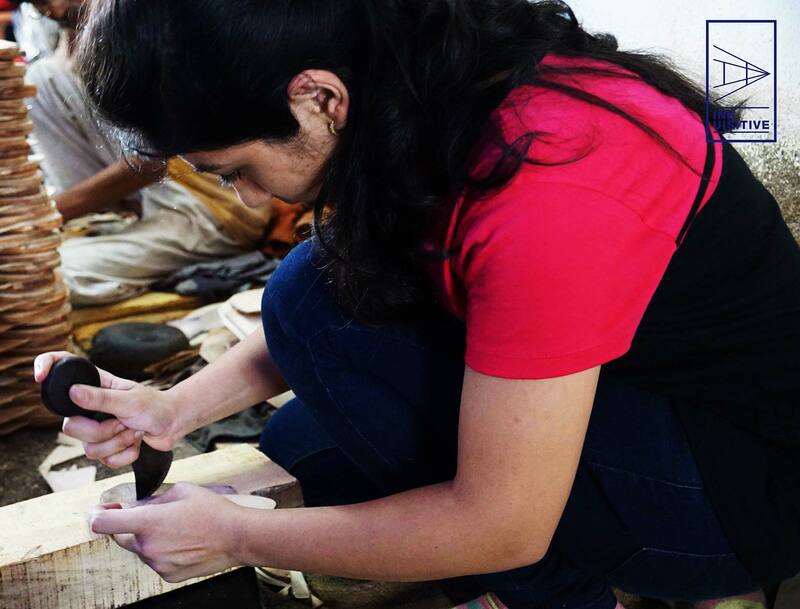 Having methodically understood the craft and its procedures, the students ensued to design their own chappals by giving the traditional designs a contemporary remodeling. The day ended with the students submitting dummy paper models of the chappals, the actual version of which will be worked on the following day. 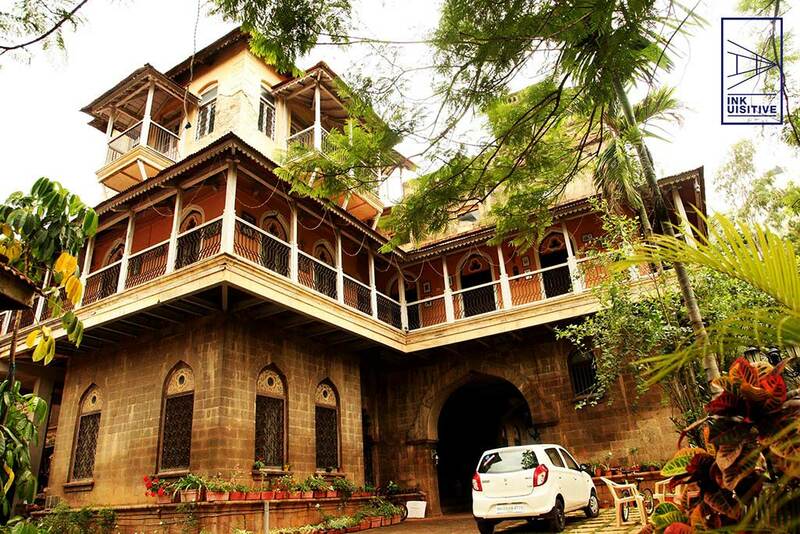 The students of interior design and set design visited the Gaikwad Wada, this beautiful Wada is the residence of Colonel Gaikwad and was built during the British Raj. This particular instance was chosen for the remarkable colonial influence it has on its architecture, and the students completed a general reconnaissance survey of the structure on day one. 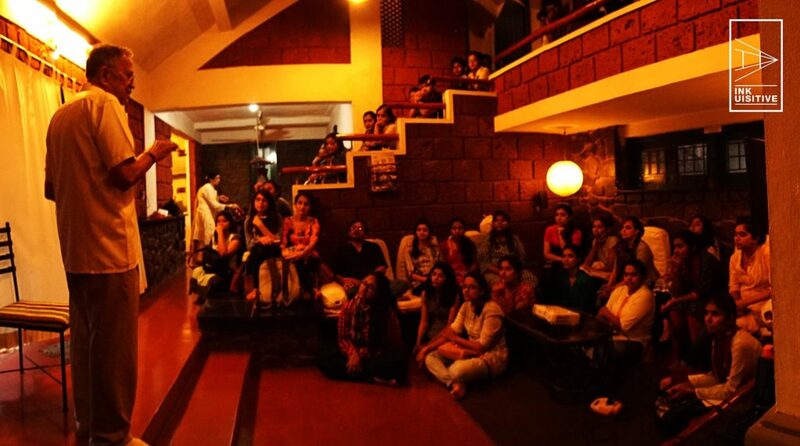 In the evening, the students were mentored on the practical aspects of theatre and cinema set design by an eminent set designer from Kolhapur. Rather than proceeding with the conformist way of demonstrations, the session was made as interactive as possible with the students asking away questions at free will, and the designer replying them with clarifications and practical cheat sheets as well. Come next day, and product design students got busy with real leather! The paper models were used as a reference, and the existing stencils were logically utilized by students to outline the forms before proceeding to cut the leather. Once into making it, the students realized that the trade is not half as easy as it seems with many having a hard time bringing their piece of leather to a proper shape. 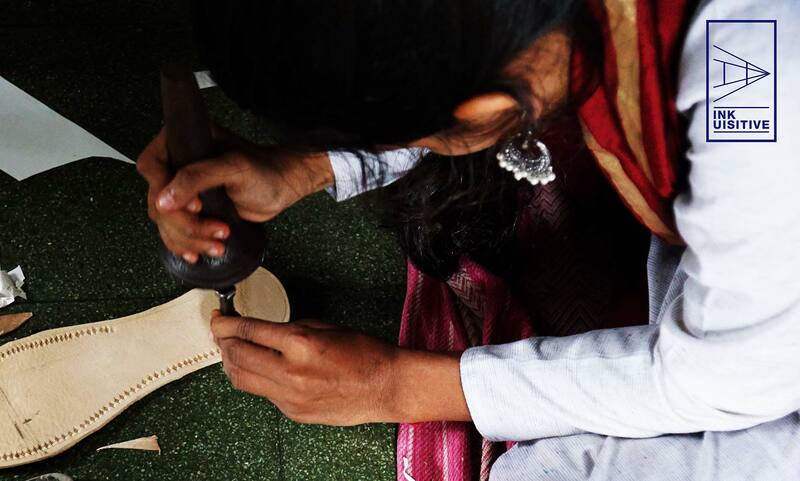 They were taught by a plethora of expert artisans about the various steps of making a chappal. After an exciting but sweaty day of cutting the leather, stitching it, braiding it, putting ornamentations and embossing it before giving the final polish, the students handed over their finished products. This was a first person hands-on experience for the students, and it was followed by a stark realization- it is harder to do it than it looks! The rest of the students did a detailed analysis of the Gaikwad Wada. The study included a detailed documentation of the colonial influence on the Wada, the distinct architectural elements, interior decoration details, as well as furniture study. The Gaikwad Wada can be markedly characterized as a Pangu Wada and is 125 years old and located near Mahalaxmi Temple in Kolhapur. Typical Maharashtrian elements can be seen in its architecture and interiors – especially the elaborate Devghar work inside the house. The day concluded with a small session by Ar. Mohan Waichal from Kolhapur in his beautifully designed farmhouse. Day three kicked off with an hour’s bus journey to Khidrapur. The students were visiting Kopeshwar temple, one of the best examples of temple architecture in the country. 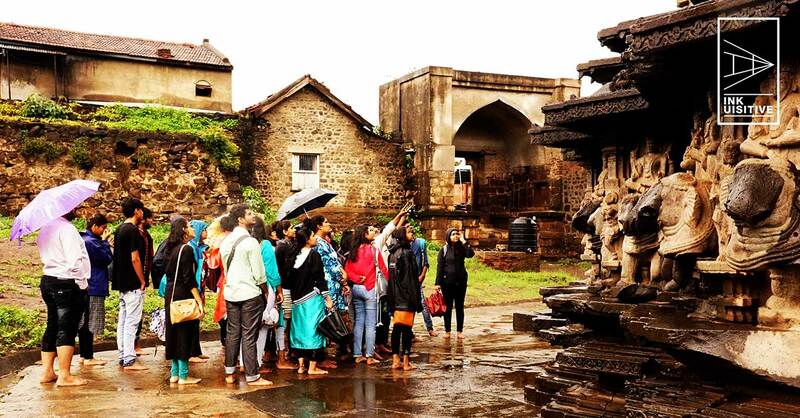 Notwithstanding the initial inconvenience caused by rain, experiencing the chill of the wet stones was an exhilarating experience; known for the gorgeous stone carvings, students explored the architecture and the mythological stories associated with the temple. On the way back, students visited the village of Hupari. Also known as Silver Nagari, Hupari is globally famous for its exquisite silverwares. 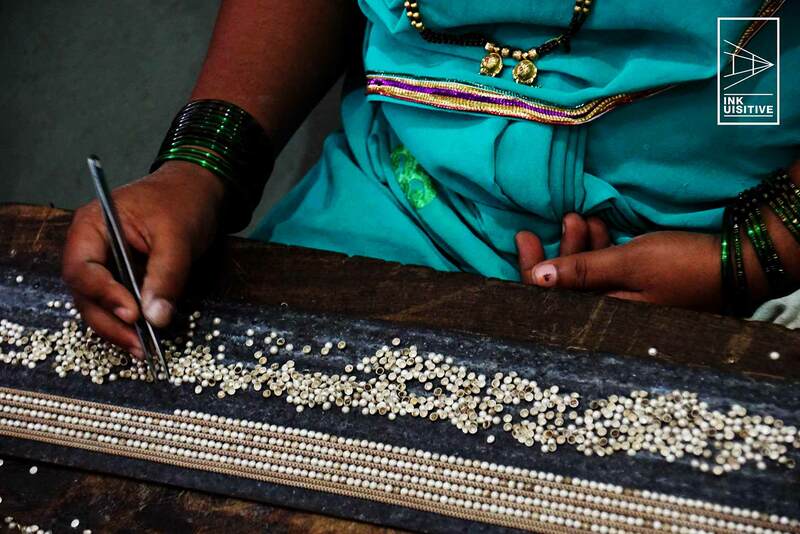 Located around 20 km from Kolhapur city, the entire village is into silver jewelry manufacturing since past century. The students explored the approaches of manufacturing silver jewelry by visiting the various workshops and production units in the village. 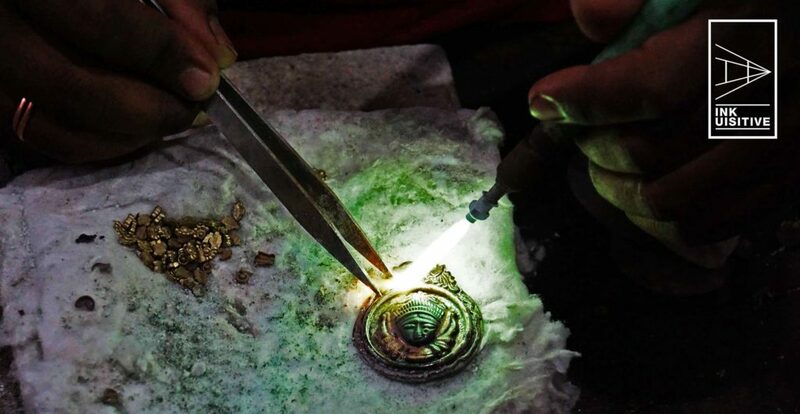 Students of product design proceeded to do a detailed documentation of the procedure followed by light training on how to deal with precious metals like silver and carve out beautiful designs out of the same. It was a hectic day, and having completed the study, the students proceeded for an overnight stay at the hotel. 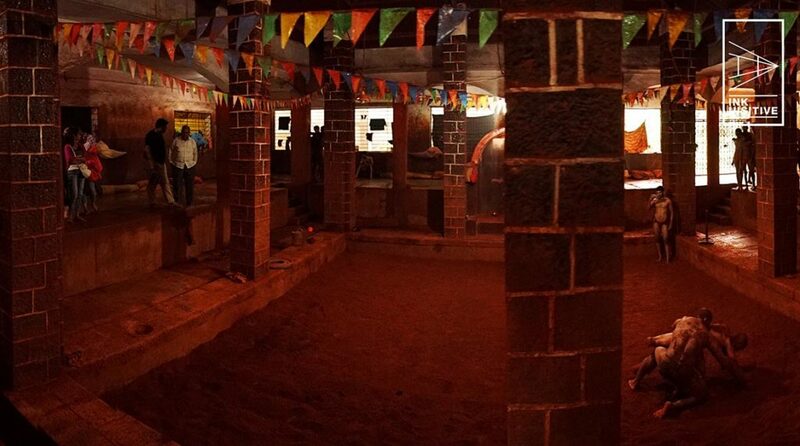 The final day in Kolhapur was reserved for an exclusive heritage walk of the Kolhapur town. 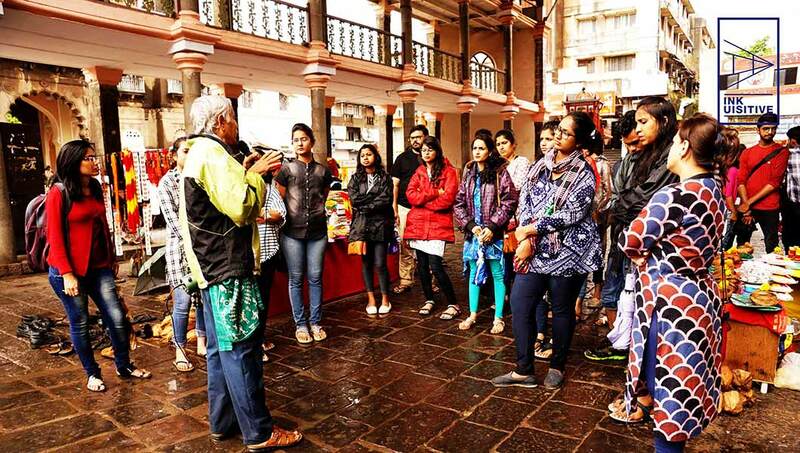 Guided by noted historian Umakant Raninga, the students explored the old fabric of Kolhapur city – palaces, temples, squares, akhaadas, markets, and food! Kolhapur has so much to offer with an impressive historical background. But the spotlight of the entire walk was the Motibaugh Talim, a desi kushtishala, or akhaada as we call it. Experiencing a phenomenon (that is seen only in movies) live was an enchanting experience for the students. The master presented a small talk wherein he stressed on the importance of physical fitness, and the importance of soil; he urged the students to leave the comfort of the modern age and invited them for a round of kushti in the soil ring. None dared to! The walk ended with a visit to Shalini Palace and Khasbagh maidan following which, we proceeded to board the bus back to Nashik. Special focus was given to keeping the trip short, light paced and less hectic for the students. This was done so as to guarantee the students can dedicate their mental and physical indulgence to some practical drill and gain some experience out of the same. The program was crisp, and enjoyable and was kept simple so as to minimalize chances of perplexing students with too much information. Simplicity they say is the key to good learning. Look out to this page for more updates from this trip- we will be doing two special features on Kolhapuri Chappals and Hupari Silverware very soon. Till then, Cheers!